Portraitist David Tomb may not be a dedicated wildlife artist like Audubon or Fuertes, but he is a dedicated birder who has created mixed-media paintings on paper (complemented by tropical plants, stuffed birds, and recorded birdsong) based on his pilgrimages to bird habitats in Mexico’s Chihuahua, San Blas, Jalisco, and El Triunfo. This show examines the wildlife of northern Mexico, mostly avian, but also pedestrians like the roadrunner and Gila monster. More typical are depictions on medium-sized or large sheets of watercolor paper that place their perched, paused subjects–e.g., aplomado falcon, chachalaca, vermilion flycatcher, great kiskadee, tropical parula, and crimson-collared grosbeak–atop contorted branches and sprays of foliage before blank or blurred backgrounds. The birds are rendered accurately enough to suit any birder, but without the hyperreal detail that Audubon captured, having shot his models–or his anthropomorphic sense of drama. 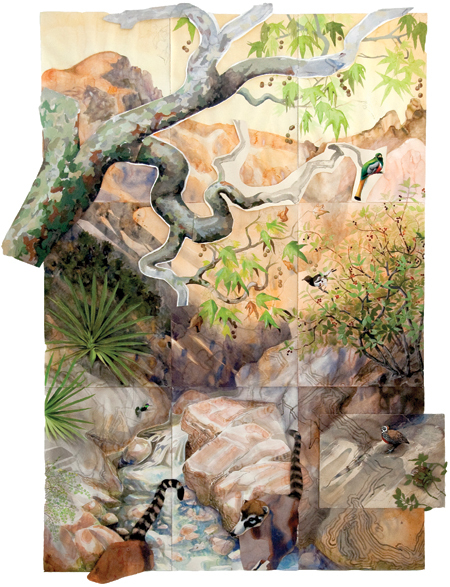 Instead, Tomb depicts moments of stasis–birds caught by the camera and given a larger, eternal context via artistic license, with the artifice occasionally revealed, as in Border Troop, a monumental collage of unretouched fragments, or the single-sheet Ferruginous Pygmy Owl and Green Jays, clearly a composite view. Tomb’s goal in both painting and politics is clearly preservation; he combines art and environmentalism in a way that is accessible both to children, who have flocked to the show with their schoolmates, and to wary, solitary adults working their way down their “life lists” of must-see art.